York Lo: For more details about Fook Hing Oil, please refer to Stanley Kwan’s “The Dragon and the Crown: Hong Kong Memoirs”. Stanley – better known as the father of the Hang Seng Index – was actually related to Chan Lim Pak by marriage – his father in law Chan Yue-chik was Chan Limpak’s 9th uncle. (Yuechik’s father and Limpak’s grandfather Chan Kaiyuan founded the first modern silk weaving mill in China). 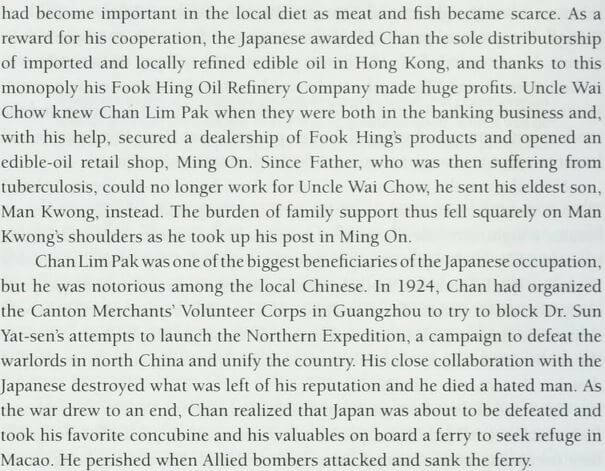 During the Japanese occupation of Hong Kong Fook Hing supposedly had the monopoly of locally refined and imported edible oil and Kwan’s uncle actually was one of Fook Hing’s distributors. York continues: Another version of his death can be found at the Gwulo link below which is the 1944 HK News article reporting Chan’s death and the Japanese Army controlled press claim that Chan was killed by machine gun bullets fired by the Americans. Incidentally, Kwok Lam-po (later chairman of Wing On) and his wife Silvia Li (sister of Li Tse-fong and Li Kwun-chun) were also on board the Lingnan Maru – they were knocked unconscious but were miraculously rescued and that experience prompted him to be very active with the YMCA and other Christian causes after the war. David Lam, the late governor-general of British Columbia was originally supposed to be on the Lingnan Maru but gave his ticket to a cousin who sadly perished. This article was first posted on 25th August 2015.